​CAME OUT FOR OUR 27TH YEAR! Click below to view some of our amazing highlights of the day! 27TH YEAR PHOTOS ARE HERE!!! This year's Christmas in Summer was a success! A big shout-out to the Duxbury Fire Department for escorting Santa safely to camp. ​See highlights of the day here. The LPM Charitable Foundation is a non-profit organization developed to give back 100% of the donations to benefit selected charitable and community organizations. Founded by Robert J. Watson, President and CEO of LPM Holding Co. Inc., in 1991 to help support and give back to the communities in which he lives, and serves through his businesses. In the past 16 years, LPM Chartiable Foundation has given over 1.8 million dollars in charitable donations to worthy causes. The first tournament in 1991 had only 40 golfers and the money raised barely covered expenses. We've come a long way! It is the intention of the LPM Charitable Foundation to be involved in and aware of the concerns and needs facing the communities of which the company is a part. The Foundation will marshal available resources of funds, manpower, goods and services to address positively local, high-priority concerns and needs that meet with Foundation priorities and guidelines. The Foundation's primary focus will be on the prudent investment of our available resources in programs in the areas of education, environment, health and human services, community and civic development, and the arts. In addition, consideration will be given in certain instances to grants to organizations outside these categories. According to the Boston Business Journal, The LPM Charitable Foundation is the 15th largest Charitable Organization in the Massachusetts. The Acronym “LPM” stands for Laurie, Pat, & Mike; Bob Watson's wife and two sons. to the Blood Donor Center at Children's Hospital! Starting as a whole blood donor at Boston Children's Hospital, Bob Watson (pictured here with the Blood Donor Center staff) was asked to donate platelets when the Blood Donor Center began collecting them in 1986. Twice a month for the last 27 years, Bob has been donating platelets here, ultimately achieving his 800th donation in March. 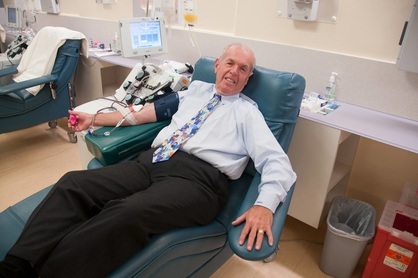 His 800 donations equal more than 94 gallons of blood and platelets! Copyright ©2019 LPM Charitable Foundation. All rights reserved.